ZLSElectric - To ensure you receive genuine Cypers Hand Warmers when shopping online, please only purchase from Cypers. Handy carrying anywhere with any pocket or bag while sporting, fishing, hiking, camping, skiing. Shockproof, Green and Healthy heat transfer. Double-sided and 3 heating warms setting 107°f42°c/118°f48/131°f55°c, heating warms your both hands, fast heating up in 3 seconds.
. 3 indicator lights keep you informed of the remaining battery and heating status. We guarantee our product with our 6 month "any reason" refund guarantee. Cypers will send a full refund or replacement a new hand warmers. As the capacity of the battery increases, the power indicator led to a 1-3 rise, and when the battery is full, the power indicator is led1-3. 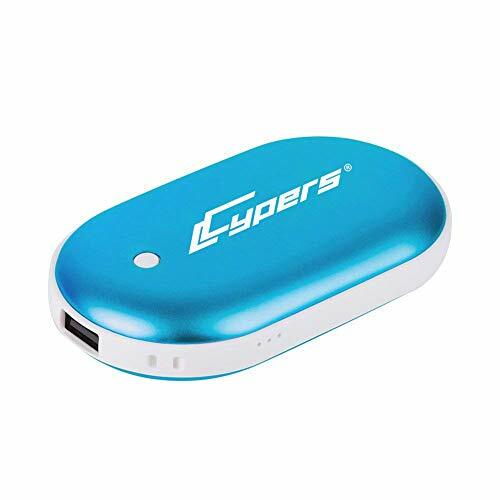 Cypers Double-Side Rechargeable Hand Warmer 5200mAh Portable Power Bank for iPhone, Samsung Galaxy and Android PhoneBlue - Package includes:1 x 5200mah hand warmer& power bank 1 x micro USB cable 1 X Cloth pouch with drawstring1 X Instructions Manual Pebble-shaped hand warmer & power bank 2-in-1. Easy turn warming on and off, warming will automatically turn off after working for an hour to save battery you can restart to use. 5200mah capacity can give a full charge to mainstream digital devices on market, Samsung Galaxy, for iPhone 7/6s/6 Plus, Nexus and other Android phone. A perfect solution in cold weather. Made of high-tech aircraft-grade aluminum and ABS matrial, Explosion-proof, Anti-skid, Radiation-free, Anti-scald, eco-friendly polymer battery. Battery capacity: 5200mahinput: 5v/2aoutput: 5v/2aproduct size: 102*59*24mmcharging time: 2-3 hoursworking time: 4-8 hoursKey function: long press the switch key 4-5s to enter the warm hand state display red light, and then press the button to exit the warm hand modeHeating temperature: Low temp - one red light, then switch the gear switch by switch button, T: about 95-107. ThreeLeaf - Optional - rose gold √battery capacity:5200mah √input:5V/2A √Output:5V/2A √Product Size: L4*W2. 3*h094 inch 102*58. 8*24mm √product N. W. About 4. 7 oz 133g √product G. W. About 8. 5 oz 246g √charging time: 2-3 hours √working time: 4-10 hours √colors: rose gold√packing list: 1pc Hand Warmer, 1pc sling, 1pc Flannel bags, 1pc 2A Charging Cable, 1pc user manual √Button functions: Long press 4-5sec. Power on with red-lights into warmer mode Short press ONCE each, red-lights 3stars optional Low/Medium/High temp. Long press 4-5sec. Power off short press twice, battery showing with blue-lights Blue-lights shutoff automatically in 40sec. Cheap replica is unqualified and unsafe looking for a rechargeable portable Hand warmer That also charges your Smartphone and other USB digital Devices? 5-10hrs HAND WARMER up to130℉, High/Medium/Low temp. Rechargeable Hand Warmer 5200mAh 10Hour Electronic Portable Instant Heating / USB Back-up Power Back Battery For Samsung.iPhone - 3hours hand warmer constant 122℉50℃ - purple or pink √charges via either usb or ac adapter ac110-250v/ 50- 60hz √Battery Capacity:4400mAh √Input:5V/1A √Output:5V/1A √Product Size: L4*W2. 3*h094 inch 100*95*60mm √Product N. W. About 4. BigBlue - Your most valuable winter mate & gift !capacity: 6000mah as reference, iphone 7 battery capacity 1960mAh, High Quality Heat-Conducting Medium, 7 Plus 2900mAhMaterial: Aluminium Alloy Surface, needs a shorter time to be warm. Size: 152*11*75mm l*h*wweight: 180gcolor: christmas red special version/blackrated temperature in low position: 35℃Rated Temperature in High Position: 45℃Brand New Holding Experience: Smooth Edge & Pebble Shaped fits for Your Hands' Radian, Accord with the Hands' size as well. Evenly heating: a larger Surface Area Provides more Heat When Using. Safer & more convenient: electric power Source makes it More Compact and Convenient so can Easily Be Stored away when not in use. Easy to be charged: Comes with Cable and USB 2. 0 connector, simply plug into your Computer or Any Main USB Adaptor to charge Mains Adapter Not Included. BigBlue 6000mAh Rechargeable Hand Warmer 3-in-1 Black - No fuel needed & safer: never worried to be Scald Anymore, The Built-In Chip will Cut off the Current when it's too hot. Notice: 1. When the fourth rest power Indicator is Twinkling, You Have to Charge the Hand Warmer. Our product can be used as Emergency Light as well. Warmth and healthy: awesome instant electronic hand warmers not onlY cold hands relief, BUT ALSO helps soothe the pain and uncomfortable of Menstrual, sufferers with arthritic hands and arthritis pain. When charging the hand warmer, Please Make Sure the Slide Switch is in "Off". Zippo Manufacturing Company Inc. 40485 - Pocket hand warmer: double-sided heating and two heat settings are the perfect solution in cold weather, up to 90% rated temperature in 30 seconds, hiking, fishing, clearly perceived heating-up! Handy carrying anywhere with any pocket or bag while sporting, camping or skiing. Choice for outdoor recreation: build-in 6000mah lithium polymer battery, Samsung devices, portable game consoles and MP3/MP4 players, kindle, iPod, tablet, universal charge with iPhone, digital GoPro cameras, etc. With smooth edge for better holding experience and transmiting heat, our design shape is more comfortable to hold. Hassle-free warranty: 30 days money-back & 2 years warranty, if you have any issues with this product, email or call our customer service team and we will be happy to assist you. Charges usb compatible devices including; mobile phones, cameras, tablets, Mp3 players, etc. Zippo 6-Hour green Rechargeable Hand Warmer - Dual sided heat up to 120°f / 50°c operating temperature with five 5 heat settings for adjustable and comfortable warmth. 1 year warranty. This dependable and rechargeable hand warmer keeps you warm from the stadium to the woods. Intelligent chip inside for safety protection, Explosion-proof and Radiation-free. A perfect gift: as a winter gift or christmas gift, give your warm and care to your parents or girl&boy friend in this winter. Free 2a usb line for Andriod mobile, and use iPhone line for iPhone charge. - Safe fast heat, smooth touching warm up double-sides rapidly in 10sec. Palm size perfect for holding, so smooth and exactly same touching feel as iPhone 6S casing. Daylong warm, up to 7hours heat medium 110~118℉, 2hour quick charge up to 10hours heat auto 100~107℉, up to 5hours heat high 120~130℉; Quick charging 2-3hours with free 2A usb line. Back-up 2batteries iphone full capacity 5200mah with max_500 recharges can give 2-4charges to Samsung/iPhone series and etc. With smooth edge for better holding experience and transmiting heat, our design shape is more comfortable to hold. Hassle-free warranty: 30 days money-back & 2 years warranty, if you have any issues with this product, email or call our customer service team and we will be happy to assist you. ThreeLeaf Rechargeable Hand Warmer 5200mAh Electronic Portable Instant Heating/USB Back-up Power Back Battery for Samsung.iPhone - Charges usb compatible devices including; mobile phones, Mp3 players, tablets, cameras, etc. Dual sided heat up to 120°f / 50°c operating temperature with five 5 heat settings for adjustable and comfortable warmth. Rechargeable 5200 mah lithium-ion battery included for lasting reliable warmth - up to 6 hour run time. Free 2a usb line for Andriod mobile, and use iPhone line for iPhone charge. 1-button control, red 2-star: medium 110~118℉, 3-heat adjustable only 1-button for power switch and one short press into Heat mode ; 3-heat optional may suit different heat demands red 1-star: auto 100~107℉, red 3-star: high 120~130℉. Note : don't expose the warmer directly to outside low temperature, just put it in given little bag or in your pocket, and this will maintain and ensure the long lifetime of warmer heatING. SLB - Free 2a usb line for Andriod mobile, and use iPhone line for iPhone charge. 1-button control, 3-heat adjustable only 1-button for power switch and one short press into Heat mode ; 3-heat optional may suit different heat demands red 1-star: auto 100~107℉, red 2-star: medium 110~118℉, red 3-star: high 120~130℉. Note : don't expose the warmer directly to outside low temperature, just put it in given little bag or in your pocket, and this will maintain and ensure the long lifetime of warmer heatING. It is convenient for traveling, camping, fishing, hiking, sports, skiing or anywhere you want to go. Pocket hand warmer: double-sided heating and two heat settings are the perfect solution in cold weather, fishing, up to 90% rated temperature in 30 seconds, clearly perceived heating-up! Handy carrying anywhere with any pocket or bag while sporting, hiking, camping or skiing. 5200mAh Portable USB Electric Hand Warmer 2-in-1 Double-Sided Pocket Hand Warmers with Power Bank for Camping - SLB Rechargeable Hand Warmers - Choice for outdoor recreation: build-in 6000mah lithium polymer battery, kindle, tablet, portable game consoles and MP3/MP4 players, iPod, universal charge with iPhone, digital GoPro cameras, Samsung devices, etc. With smooth edge for better holding experience and transmiting heat, our design shape is more comfortable to hold. Hassle-free warranty: 30 days money-back & 2 years warranty, if you have any issues with this product, email or call our customer service team and we will be happy to assist you. Charges usb compatible devices including; mobile phones, cameras, Mp3 players, tablets, etc. Dual sided heat up to 120°f / 50°c operating temperature with five 5 heat settings for adjustable and comfortable warmth. This cool, compact, fun and convenient hand warmer will keep you warm all Winter! Features: 1. Letouch - The hand warmer is very controllable and cosy, you can turn it on and off when you need. Fits most electronic devices phones, tablets, etccharged via USB cable. This pebbles hand warmer will warm her heart and her hands as well ;-. Exquisite gift packing box, Raynaud's Disease / Syndrome sufferers, Fatigue, perfect gift for family and friends. Intelligent chip inside for safety protection, Explosion-proof and Radiation-free. A perfect gift: as a winter gift or christmas gift, give your warm and care to your parents or girl&boy friend in this winter. Our product can be used as Emergency Light as well. Warmth and healthy: awesome instant electronic hand warmers not onlY cold hands relief, BUT ALSO helps soothe the pain and uncomfortable of Menstrual, sufferers with arthritic hands and arthritis pain. Letouch Rechargeable Hand Warmer 5200mAh Power Bank, Portable USB Electric Hand Warmers Double-Sided Heating Mobile External Battery Charger Best Gift in Winter for Women,Man 5200mAh Black - Battery and heat indicator lights. Pocket hand warmer: double-sided heating and two heat settings are the perfect solution in cold weather, fishing, hiking, up to 90% rated temperature in 30 seconds, clearly perceived heating-up! Handy carrying anywhere with any pocket or bag while sporting, camping or skiing. Choice for outdoor recreation: build-in 6000mah lithium polymer battery, tablet, Samsung devices, portable game consoles and MP3/MP4 players, kindle, iPod, digital GoPro cameras, universal charge with iPhone, etc.3 indicator lights keep you informed of the remaining battery and heating status. Warm & healthy】 magic pebble hand warmer power bank it helps soothe the pain and uncomfortable of Menstrual, Sufferers with arthritic hands. Press the button 2s to turn on/off and a short click to change modes, you can not use the charging function. KMI - Take one in case of running out of battery at outdoors. Upgraded security: rohs, eco-friendly polymer battery shockproof, Anti-scald, fcc certified the portable hand warmer is made of high quality aircraft-grade aluminum and ABS material, Radiation-free, Explosion-proof, CE, Anti-skid, Green and Healthy heat transfer. Great gift idea】 do you want your partner to think of you even when you are not around? Give her the gift of warmth. 2-in-1 portable hand warmer and power bank: this is not only a mini quick heat usB hand warmer but also an emergency power bank, which is a very cool gadget gift for cold people that provides continuously cozy warmth in cold winter. Portable and delicate design : the rechargeable pocket hand warmers can be easily hold by one hand for the features of lightweight & palm size. 1 year warranty. Battery and heat indicator lights. Easy turn warming on and off, 113~122℉ 45~50℃, 122~131℉ 50~55℃, 3 levels of temperature heating warms your both hands, Warming will automatically turn off after working for an hour to save batteryyou can restart to use. As seen on NewYork Times, TV Shows - Best Christmas Gift - EnergyFlux Ellipse 5200mAh Rechargeable Wrap-around Hand Warmer / USB External Battery Pack - Electronic USB Hand Warmer with Power Bank - Hight capacity 5200mah】 can give a full charge to mainstream digital devices on market, 6s, 7, smartphones like iPhone X, Huawei, 6 Plus, 8, Samsung Galaxy and other Android phone. This pebbles hand warmer will warm her heart and her hands as well ;-. The red light will flash fastercheck battery: short press the button any time to see blue battery indicatorsTurn heat off: Hold down the button until all indicator lights turn offUse a charger: Connect with the USB cable provided by your digital device to start charging right awayREMINDERS! * Yup, it's an upgrade, but that this doesn't mean we're promising miracles either. Placing it in your gloves, pockets or scarfCONTENTSMain unit 3. Vshow - Press the button 2s to turn on/off and a short click to change modes, you can not use the charging function. High capacity rechargeable power banks: the electronic usB hand warmer comes with 5200mAh built-in rechargeable battery. It is convenient for traveling, hiking, sports, fishing, camping, skiing or anywhere you want to go. Free 2a usb line for Andriod mobile, and use iPhone line for iPhone charge. 1-button control, 3-heat adjustable only 1-button for power switch and one short press into Heat mode ; 3-heat optional may suit different heat demands red 1-star: auto 100~107℉, red 2-star: medium 110~118℉, red 3-star: high 120~130℉. Blue - USB Rechargeable Electric Hand Warmer 5200mAh，Vshow Baby Dolphin Pocket Portable Warmer Double-Side Heat and Emergency Phone Charger - Note : don't expose the warmer directly to outside low temperature, just put it in given little bag or in your pocket, and this will maintain and ensure the long lifetime of warmer heatING. Take one in case of running out of battery at outdoors. Upgraded security: rohs, anti-skid, eco-friendly polymer battery Shockproof, fcc certified the portable hand warmer is made of high quality aircraft-grade aluminum and ABS material, Anti-scald, Radiation-free, CE, Explosion-proof, Green and Healthy heat transfer. Great gift idea】 do you want your partner to think of you even when you are not around? Give her the gift of warmth. Specifications: input: 5v/2a; output: 5v/2a; capacity: 5200mah; weight: 135g; size: 102*59*24mm; charging time: 2-3 hours; working time: 5-10 hours Temperature:113℉/ 131℉ What you get? 1*Baby Dolphin Hand Warmer 1*User Manual 1*Quality certificate 1* Charging cable 1*Lanyard 1* Gift-wrap Warm Tips: Do not charging and heating simultaneously. No afraid of cold weather any more. Adjustable temperature hand warmers: double-sided and constant 113℉45℃～131℉55℃ heating warms your both hands, PLEASE NOTE: under hand-warm mode, fast heating up in 5 seconds. Fourheart - Easy turn warming on and off, warming will automatically turn off after working for an hour to save batteryyou can restart to use. Intelligent chip inside for safety protection, Explosion-proof and Radiation-free. A perfect gift: as a winter gift or christmas gift, give your warm and care to your parents or girl&boy friend in this winter. Handy carrying anywhere with any pocket or bag while sporting, fishing, hiking, camping, skiing. How to make it be warm? Press the middle button for 5 seconds. When the three lights on, reached the highest temperature of about 131°F55°C. Large capacity: 5200mah capacity can give a full charge to mainstream digital devices on market, for iPhone 8/7/6s Plus, Samsung Galaxy and other Android phone. E-TECHING Pebbles Double-Side USB Rechargeable Hand Warmer / 5200mAh Power Bank for iPhone/Samsung Galaxy/HTC/SONY/ LenovoRose Gold - Press the button 2s to turn on/off and a short click to change modes, you can not use the charging function. High capacity rechargeable power banks: the electronic usB hand warmer comes with 5200mAh built-in rechargeable battery. Battery and heat indicator lights. Pocket hand warmer: double-sided heating and two heat settings are the perfect solution in cold weather, fishing, up to 90% rated temperature in 30 seconds, hiking, clearly perceived heating-up! Handy carrying anywhere with any pocket or bag while sporting, camping or skiing. Choice for outdoor recreation: build-in 6000mah lithium polymer battery, tablet, Samsung devices, digital GoPro cameras, kindle, portable game consoles and MP3/MP4 players, universal charge with iPhone, iPod, etc.3 indicator lights keep you informed of the remaining battery and heating status. 2*5. 9*2. 4cm charging time: 2-3 hours working time: 5-10 hours The lasting time depends on external temperature and heat settings How to use it? One button controls it all. Battery and heat indicator lights. Powerful battery with power bank function - Recharge your devices, MP3 players, digital cameras, including mobile phones, etc. KARECEL Rechargeable Hand Warmers, Electric Hand Warmer 5200mAh Powerbank Reusable Handwarmers, Portable USB Hand Warmer Heater Battery Pocket Warmer, Best Gifts for Men and Women in Cold Winter - Save money and reuse your pocket heater - Long Capacity Rechargeable 5200mAh lithium-ion battery makes your life easier and is environmentally friendly. Rechargeable 5200 mah lithium-ion battery included for lasting reliable warmth - up to 6 hour run time. Shockproof, anti-scald, anti-skid, this mini hand warmer have built-in intelligent protection system is provided with safeguard of power on, Radiation-free, Eco-friendly lithium ion battery. Double side heated & 3 different heat settings: this cool gadget heat up within seconds.